It can be argued that K-12 online instruction in and of itself is no better or worse than traditional teaching. Sometimes it works well, and sometimes it fails miserably. In any case, the education industry is eagerly embracing online methods in yet another attempt to “innovate” K-12 education. … by the year 2019 half of all classes for grades K-12 will be taught online. That’s the prediction from Clayton Christensen, author of Disrupting Class: How Disruptive Innovation Will Transform the Way the World Learns. I will not be surprised to see this come true. There is very little good research on K-12 online learning. … the results of meta-analyses of K-12 studies do not show a decided edge for students taking online courses or in virtual full-time schools performing even marginally above students who are in teacher-led classrooms. More striking, however, is that only a few studies of virtual instruction in K-12 schools meet the minimum quality threshold for design, sampling, and methodologies…. Online instruction fills a need and is effective for some K-12 students. Those benefits include flexibility and efficiency. Taking all or a few classes online gives students more opportunities than ever before. They have more opportunities to work while in school, gaining valuable job experience that economists show increases their ability to move up the ladder later in life. They can chase serious interests like athletics, music, or volunteering, and spend more time in the real world than preparing for it. 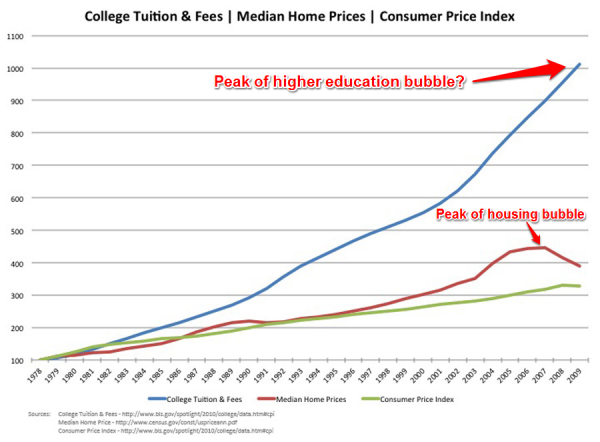 Any combination of lousy administration, inept teachers, and poor curriculum will produce poor results whether online or traditional methods are used. 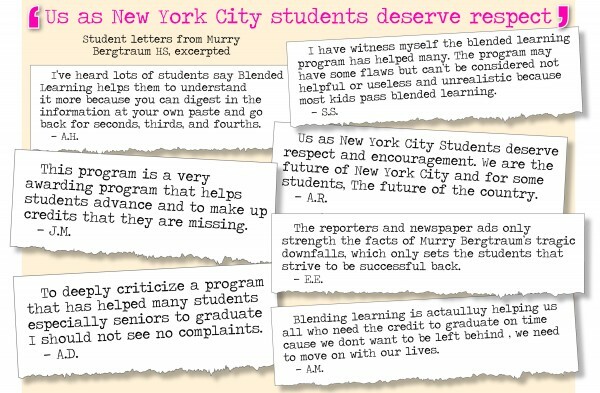 Here are letters from Manhattan’s Murry Bergtraum high school students defending their fraudulent blended-learning program where one “social-studies teacher had a roster of 475 students in all grades and subjects”. A junior wrote that the program “made it less challenging and more understandable. We watched a video, answer a few questions, and took an online quiz/test. It was simple, and reasonable.” This helped him score 85 in chemistry, he said. But professors at CUNY — where nearly 80 percent of New York City grads who attend must take remedial classes in math, reading or writing — said online instruction often leaves students ill-prepared.